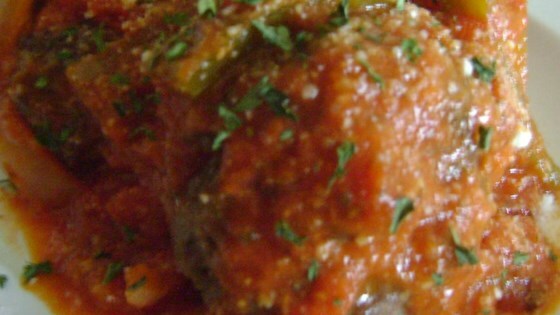 "This is my version of meatballs based on experimentation from several different recipes, including my mother’s. I like to use these in spaghetti sauce, of course, but they’re also delicious in my meatball subs.You can double or triple the recipe – sky’s the limit! – and freeze." Preheat an oven to 425 degrees F (220 degrees C). Line a large baking sheet with parchment paper. Mix together the ground beef, onion, bread crumbs, Parmesan cheese, eggs, garlic, oregano, basil, thyme, Worcestershire sauce, salt, and pepper in a large bowl until just combined. Divide the mixture into 4 equal portions, then roll each of those portions into 4 meatballs. Arrange the meatballs on the prepared baking sheet. Bake in the preheated oven until no longer pink in the center, 15 to 20 minutes.